WAUKESHA, WI/NEW YORK, N.Y. (October 8, 2018) –Kalmbach Media, the content creator of such well-known and respected media brands as Astronomy, Discover, FineScale Modeler, Scale Auto, Model Railroader, and Trains, continues to expand its extensive e-commerce offerings with the release today of its first-ever globe showing the features of Jupiter’s most storied moon, Europa. Discovered by Galileo in 1609, the mysterious moon has come to be a favorite of science lovers all over the world in recent years, with scientists speculating about the possibility of microbial life existing in the moon’s subsurface oceans. 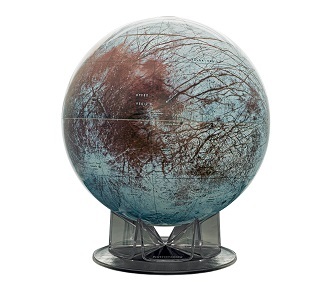 The Europa globe is the latest addition to Kalmbach’s exclusive line of e-commerce products such as globes including Pluto (the first ever globe), Mars, Venus, and Mercury, all of which are available from MyScienceShop.com. Kalmbach’s focus on e-commerce has resulted in significant year-over-year growth, especially in the science and STEM categories. Since its launch in 2015, MyScienceShop.com e-commerce revenue has grown over 300%. This substantial growth is due to the 150% increase in site traffic, and the release of more than 500 new products on the Kalmbach science storefront. A number of those products, like the globes, are company exclusives. According to David Eicher from Astronomy, Europa which orbits Jupiter, the largest planet in the solar system, “has been the subject of scrutiny by astronomers since the Voyager robotic spacecraft visited the Jovian system in the 1970s.” Recently the extraordinary moon has been studied by the Galileo spacecraft. The new globe was produced under Kalmbach’s Astronomy brand based on data collected by these spacecraft and in association with the U.S. Geological Survey. The globe depicts the moon’s icy surface in unprecedented detail, spanning 12 inches across and containing 110 labeled features of many types — craters, plains, ridges, cracks, and regions of land broken up in form or distinct in color from surrounding areas. The full color, high-quality Europa globe retails for $99.95 and is available exclusively in the Kalmbach science storefront.